So, yeah - I saw this in oooOoh, 2000 in London for Levi's engineered jeans. The campaign was by Cunning. Aye, we did it over 6 cities if memory service me right...I remember doing the project up in Newcastle. The jeans were stolenm in less than 5 minutes! I've always wondered about the legality of these campaigns. If it is well known who the agency responsible is, how do they not catch vandalism charges? Or is that all included in their fee? This has to be the most UNORIGINAL campaign I have seen recently. 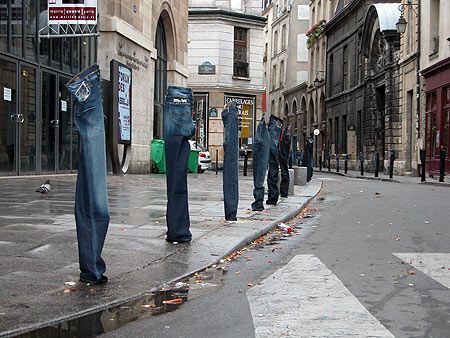 Hanging jeans on a washing line? Over parking meters? Was this put together by a bunch of interns following notes from study guides? Forget 2000, try 1995. Forget guerilla. This campaign is actually an insult to Parisans. It's simply dreadful. Vanessa the best I remember this trick was tried back in the 1960's by Wrangler or a retail store In Oklahoma City. I am a little like Floyd, if the publicity is there you win. The cost,not much! Sorry Roy, but in 1960 we were not born yet ! This campaign was certainly a "never seen before in Paris" even if it is maybe not the case all over the world. It was a part of a more global campaign with a traffic driving and a PR party... And if you understand the french comments on our blog, you will see that french people find it fun :-) That's the most important for us.